Annuals (sometimes winter annuals), 10-40(-50) cm; fibrous-rooted or taprooted. Stems erect to decumbent-ascending, densely but loosely pannose or pannose-tomentose. Leaves basal and cauline, basal and proximal cauline usually withering before flowering; blades oblanceolate to spatulate, 1-6 cm × 5-14 mm (distal similar, at least among proximal heads, margins sometimes sinuate), faces usually bicolor, abaxial closely white-pannose, adaxial usually sparsely arachnose (basal cells of hairs persistent, expanded, glassy), sometimes glabrescent. Heads initially in continuous spiciform arrays 1-4(-5) cm × (5-)10-15 mm, later interrupted (glomerules widely separated, bracteate, the proximal often on relatively long peduncles). Involucres turbinate-cylindric, 4-4.5 mm, bases sparsely arachnose. Phyllaries in 4-5 series, outer ovate-triangular, lengths 1/3-2/3 inner, apices acute-acuminate, inner triangular-lanceolate (usually striate), laminae purplish (in bud) to whitish or silvery (in fruit), apices acute (not apiculate). Florets: bisexual 3-4; all corollas usually purplish distally. Cypselae (tan) 0.6-0.7 mm. 2n = 14, 28. Flowering Apr-May(-Jun). Open, usually disturbed, commonly sandy habitats, roadsides, fields, woodland clearings and edges; 5-300 m; Ont. ; Ala., Ariz., Ark. Conn., Del., D.C., Fla., Ga., Ill., Ind., Iowa, Kans., Ky., La., Maine, Md., Mass., Mich., Miss., Mo., N.J., N.Y., N.C., Ohio, Okla., Pa., R.I., S.C., Tenn., Tex., Va., W.Va.; Mexico; West Indies; Central America (Nicaragua); South America; Pacific Islands (Hawaii). Gamochaeta purpurea apparently is native to North America and adventive elsewhere. Basal cells of hairs on adaxial faces of leaves are expanded and glassy (versus hairs filiform to bases in most other species) and are diagnostic for Gamochaeta purpurea. From Maryland northward, plants of G. purpurea produce relatively small basal rosettes and relatively shallow fibrous roots or a filiform taproot; southward and southwestward, the basal rosettes often are larger and the fibrous roots are denser. Gamochaeta purpurea apparently occurs widely through the world as a weed; it is fairly clearly native to eastern North America, where it is the least weedy of the gamochaetas. Plants of G. purpurea in southern Arizona along perennial streams at the base of the Santa Catalina Mountains were first collected in 1903 (G. L. Nesom 2004) and were, perhaps, accidentally established through visitation; the same sites are heavily infested by other, more aggressive, nonnative species. 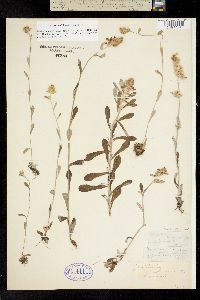 Collections of G. purpurea also have been made at higher elevations in the Santa Catalina, Rincon, and Chiricahua mountains, where the species is less likely to have been introduced by human activity. It also seems unlikely that plants in scattered Mexican localities were introduced there by human activity. This species prefers a dry, sandy soil and is more or less frequent in fallow fields and open woodland in the southern half of the state, becoming infrequent to very rare in the northern half of the state but being rapidly introduced. Duration: Perennial Nativity: Native Lifeform: Forb/Herb General: Biennial or short-lived perennial herb, 10-35 cm tall, often flowering in first season; stems ascending to erect, usually considerably branched from base, closely woolly-canescent. 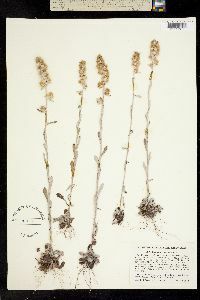 Leaves: Alternate and sessile, the basal rosette and lower cauline leaves usually withering before flowering; blades broadly spatulate, 2-6 cm long by 4-15 mm wide, finely and compactly tomentose beneath, greenish and glabrate above, mostly obtuse to rounded and often minutely apiculate at apex, gradually narrowed to a petiole-like base. Flowers: Flower heads discoid, with arachnoid hairs at the bases, arranged in spikes 1-10 cm long; involucre (ring of bracts wrapped around the flower head) top-shaped to cylindric, 4 mm high, the outer phyllaries (bracts) brownish or purplish, at least the tips, obtuse, shining; inner phyllaries thinner and paler than outer, often acutish or minutely toothed and apiculate at apex; florets all discs, numerous, 1.5-2 mm long, very slender, the corollas usually with purplish tips. Fruits: Achenes straw-colored, about 0.5 mm long, faintly roughened; topped with a pappus of 7-15 bristles which are connate at the base into in a funnel-shaped ring and falling together. Ecology: Found on open plains and slopes, ditch banks and waysides from 3,000-7,500 ft (914-2286 m); flowers March-May. Distribution: e N. Amer. from Ontario, CAN to ME, south to FL and TX; disjunct in AZ. Notes: This biennial to perennial herb closely resembles Gnaphalium and Pseudognaphalium spp. ; Gamochaeta is segregated from those two genera based on its achenes which have a pappus of bristles which are fused into a ring at the base (although Pseudognaphalium luteoalbum also has such a pappus.) The closest relative of this species is Gamochaeta stagnalis, which differs in its its height and growth form, tending to be shorter, less rigidly erect, and with more stems emerging at the base of the plant; the leaves which are about the same color on the upper and lower surfaces (G. purpurea is distinctly more grayish on the lower leaf surfaces and green on the upper leaf); and the inner (and taller) rows of phyllaries which are bluntly rounded on the tip and tend to be more strongly infused with purple (use a hand lens; G. purpurea has pointy-tipped phyllaries which are less often purple-infused). G. purpurea is a somewhat more robust plant, considered to be a biennial to short lived perennial, while G. stagnalis is commonly annual but can persist into a second year. Distinguish from P. luteoalbum by the leaves, which are distinctly green on top and gray beneath in this species, and only slightly more white-tomentose on the lower surface in P. luteoalbum. Ethnobotany: Infusion of dried plant taken for the grippe and colds. Synonyms: Gnaphalium purpureum Editor: SBuckley 2010, AHazelton 2016 Etymology: Gamochaeta comes from the Greek gamos, "marriage, stigma, female part," and chaite, "bristle, mane, long hair," thus meaning "united bristle" in reference to the connate pappus bristles; purpurea means purple.